We are our brother's keepers. but everyone of us can do something. There are times when reading about mission work that people I know and admire are doing, I get a little discouraged. Not too long after, Thank God, my righteous mind reminds me that there are many ways to give and many mission fields in which we can work. Galatians exhorts us not to grow weary in doing good (Galatians 6:9). It is better to do something, no matter how small, than not to act. This week, Holley challenged we dreamers to write about our favorite non-profit organizations. There is an organization in our local community that reminds me of the Waterfront Rescue Mission where my dad served as program director until the Lord called him home. For years my family spent every Thanksgiving and Christmas serving members of our community home cooked and lovingly donated holiday meals while providing clothing, gifts and necessities. Where once I spent every holiday at the Mobile Shelter, now my heart belongs to MESH. Mesh is Montclair Emergency Services for the Homeless, Inc. They are a “local, faith-based organization dedicated to engaging the Montclair community to provide basic and essential services to Montclair’s most vulnerable homeless adults." It all began when a local Episcopal priest grew increasingly concerned about people we all saw regularly, or perhaps tried not to...our neighbors, sleeping huddled on benches and in shallow doorways during a particularly harsh Northeastern Winter. Ours is a community where may residents do well. He decided that as a community, we could do better. I haven’t poured nearly enough time or resources into MESH yet, but the organization is energetically and soulfully led by my friend Gwen Parker Ames. She is a force of nature. More than simply providing meals and emergency shelter, MESH’s larger mission is to educate our community, as early as kindergarten, about challenges faced by the homeless and the hungry locally and globally. Kids in our community attend Homeless and Hungry Fairs where they attempt to construct viable shelters from donated cardboard boxes. It’s fun in the beginning, making Condiment Soup (which is kind of cool according to my son but not at all tasty), but the notion of dropping temperatures, no heat, and just the merest amount of rain or snow and suddenly, these well-loved, well-fed, well-exposed children have just a frightening glimpse into the lives of their neighbors. Suddenly one of the awful scary things they see on TV are problems to which they can relate, and the lives and struggles of people who were once invisible but now see regularly become very real to them, AND they want to help. Gwen takes her mission seriously. She lives her beliefs, and through FOGs (friends of Gwen) challenges us all tactically, financially, administratively, to live what we proclaim. We are our brother’s keepers, and while we may not all be able to fly across the world to make a difference in the lives of others, each of us, every one of us, can do something. So, in addition to volunteering at MESH, I’m writing about them, and using my voice to spread the word. We are our brother’s keepers. All of us. 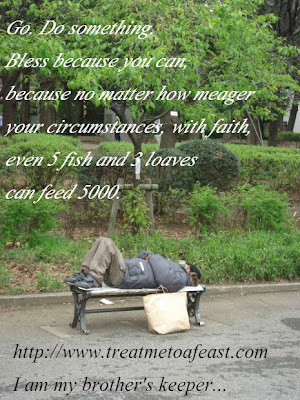 “And let us not grow weary of doing good, for in due season we will reap, if we do not give up…” Galatians 6:9 (ESV). Cain’s question, and the Lord’s answer….”Am I my brother’s keeper?” We are our brother’s keeper. All of us. Go. Do. Something. 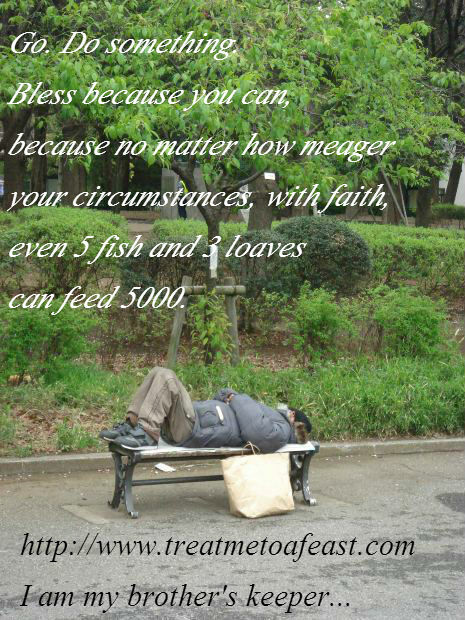 Bless because you can, because no matter how meager your circumstances, even 5 fish and 3 loaves may be shared with a multitude.